RE: Your best advice on buying components? Ebay is more cumbersome for me, the very long delays in postage can't extend the paypal/ebay protection, on ali you can. Ebay from Europe is an option for large, heavy, expensive items, I got my cnc, vacuum pump, soldering equipment and my laser from a German reseller, but shipping for smaller items from UK/DE to a country like Romania is many times more expensive than the item itself. To buy form ali I usually arrange the listings by order number, then filter by rating, then if the item is more than a dime I read the reviews to make sure they are real. (I left 5* after getting my money back a few times, afterall I haven't lost a dime but the waiting time). On ebay you sometimes get the "sold a bazzillion times" red flag, but you can't sort by nuber of orders, so you can't see the "sheep flock oppinion". LE. Oh and I keep a spreadsheet of the orders I made so I can track the parcels untill they arrive. I buy in small quantities so I get the free shipping and free customs tax (under 10 Euro). For eg. Buying 30 Arduino megas can be more expensive than 5x 6pcs orders since many sellers on ali apply shipping taxes after a number of components, 1-4pcs free shipping, 5 pcs $1.71 shipping, 6 pcs $2.31 shipping !?! chinese algos involved Also chances of getting a bad lot are smaller. Divide and conquer! @neverdie Congrats for your result, I use a "copper pour" all over the board, that makes it pass at least 2 times, once for the track and once for the pour isolation. I never mess with flatcam's multiple passes, but I believe you can get the same results. What you see in the middle are copper "silvers" that is copper left behind between traces. From the last picture of the width test is seems your bit is engraving 0.1mm wide. Try to use OpenCNCPilot instead of Chillipeppr and set the lines to be split at 1-2mm lengths and probing each 2-3mm. That should make the engraving depth more uniform. I see a couple copper flakes, maybe go even slower than 100? And give it a light sandpaper with 1000 grit or a scotchbrite sponge and some abrasive detergent for dishes? RE: Best CNC for milling/routing wood? @neverdie Seems like it's getting better, still some traces in the middle are hairthin, maybe increasing tool size in flatcam a tad? like 0.12mm so it lets the tracks be wider. 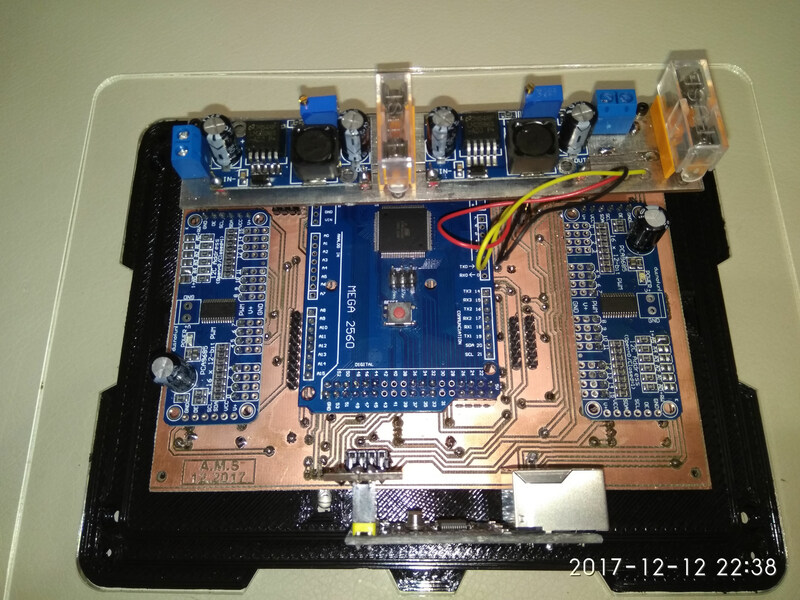 Bare in mind this is a prototyping machine, I use mine for low batch home automation boards, under 20 boards of the same kind, at the price of a blank pcb I can buy 10 for the price of one fab made 100x150mm, not to speak of wait time. 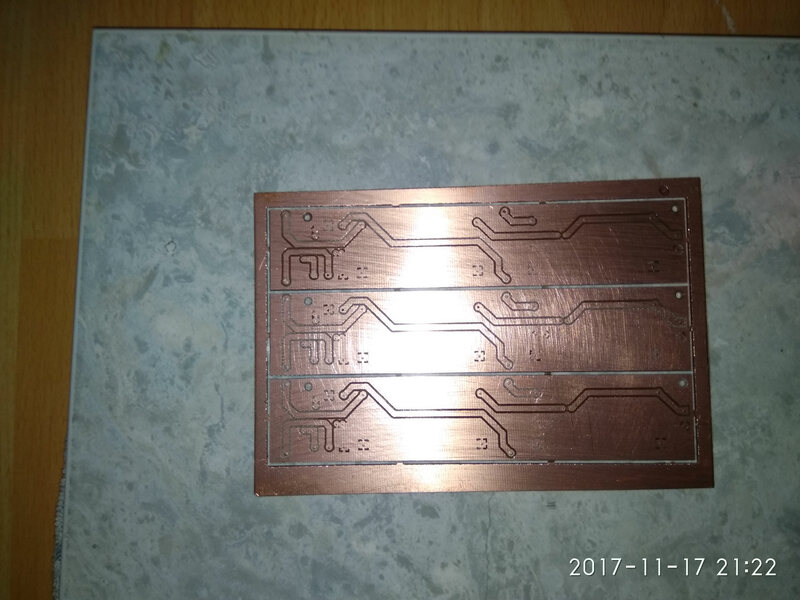 After you are satisfied with the board is time to get some plumber's paste for soldering copper pipes, that is used for tinning, or maybe you can find some liquid tinning solution, but that's more expensive here, I use the paste. @neverdie I have an idea, why don't you open the gcode in Opencncpilot, simplify it, split long moves, save it and then open in chillipeppr and do the probong and actual milling? The last bit tested is under 0.1mm wide. WOW! -run the probing: and DON'T redo Z probing after autolevel, it messes things up, use the same bit for probing and engraving. 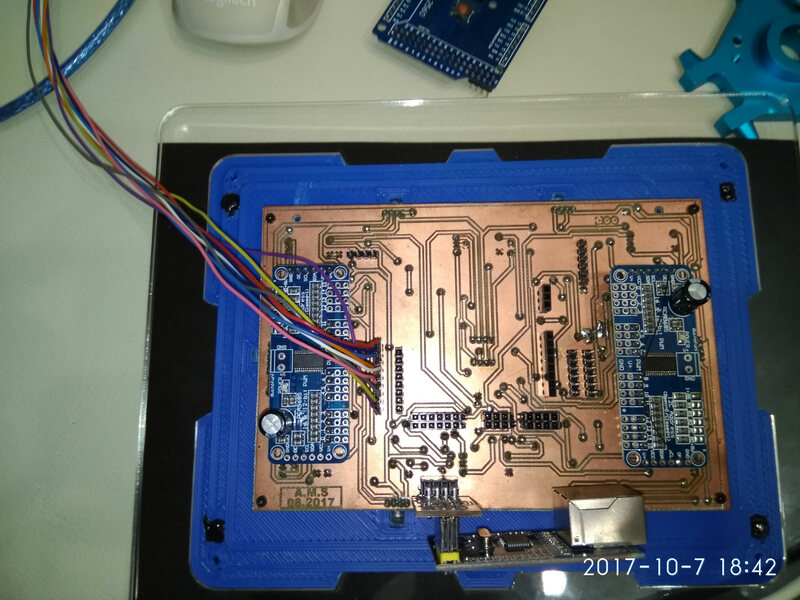 -post run: "send autoleveled gcode to workspace"
Go slower, 100-150mm/min, afterall you don't need 6mil traces for a huge board so time is not an issue here. PS. try some water/shampoo mix, it kinda' helps with engraving, cooling, lube, I don't know. PPS. I've moved to opencncpilot lately (last 2 boards), free on github, a short tut on the tube, it has a great feature that is to break long moves in 5mm segments, works better for bowed/wavy boards. The jagged edges make me believe your feedrate is a bit high for the used rpm. You can run the first gcode to determine the best feedrate, or just use something low like 200mm/min and maybe a little deeper engraving. It seems that your engraving is about 0.25mm wide, the 0.1mm is clear, 0.2mm is clear, 0.3mm is partially clear, from 0.4mm onwards you see the spacing between passes.